Science denial is an issue with significant societal impacts, whether it be denial of climate change, evolution or vaccination. 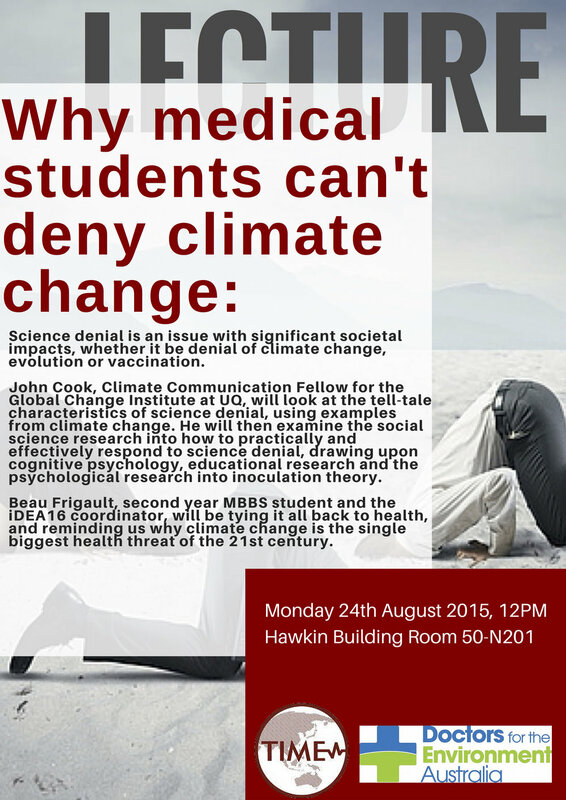 John Cook, Climate Communication Fellow for the Global Change Institute of UQ, will look at the tell tale characteristics of science denial, using examples from climate change. He will then examine the social science research into how to practically and effectively respond to science denial, drawing upon cognitive psychology, educational research, and the psychological research into inoculation theory. Beau Frigault, second year MBBS Student and the iDEA16 Coordinator, will be tying it all back to health, and reminding us why climate change is the single biggest health threat of the 21st century. For more information, head to the Facebook event here.